(CNS): Isabella Rooney of Cayman Prep & High School has won the 4th Annual Butterfield Young Musician of the Year Award. The young vocalist won over the judges to beat Shanique Ayres from John Gray High School who took 2nd place and Kenroy Millwood of Nicole Bodden’s Studio. This year’s competition showcased a variety of strong musical talent. The top three young musicians received cash awards of CI$500, CI$300, and CI$100. During the awards ceremony all twelve student competitors performed as well as the two guest judges, pianist Glen Inanga and violinist John McLaughlin Williams. Sheree Ebanks, a director at Butterfield congratulated the young musicians. “Seeing the level of such amazing talent in our youth truly inspires us to continue supporting this great award. At Butterfield, we take pridein enriching our community and supporting arts and culture in the Cayman Islands,” she said. (CNS): Offshore legal and financial services firm the Maples Group has been rebranded its corporate image and upgraded its website to offer more services online to clients. In a release this week the firm said the rebrand launched on Monday also enhanced its client service giving them multiple ways in which to access core information. The residents of Ugland House in George Town, Cayman Islands said the rebrand comprises updated websites, improved technology and focused client services to meet changing demands. The law firm is also introducing new functionality to its eServices platform which will provide greater accessibility to entity information, as well as providing more useful and convenient ways to interact with the firm, it said. in our core practice areas, delivering Cayman, Irish or British Virgin Islands legal services; and in our corporate formation, fiduciary and fund services businesses," Henry Smith, Global Managing Partner of Maples and Calder added. "Our new brand and website emphasises our firm's long standing core values of working together with our clients as a team and listening to their feedback so we can provide services which meet their needs and make their lives easier." Scott Somerville, Chief Executive Officer of MaplesFS said there was symbiosis between MaplesFS and Maples and Calder, which offered clients a comprehensive range of legal, corporate, fiduciary and administration services. "We are confident that you will find our new look, our new websites and our new messaging demonstrate the professionalism and innovativeness for which our firm is recognized," he stated. 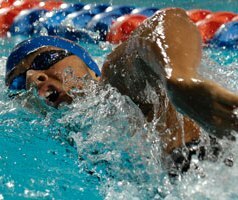 (CNS): Cayman’s swimming star Brett Fraser has earned recognition as an Academic All-American. According to the Florida University website, the two-time NCAA men’s swimming champion was named in the 2011 Capital One Academic All-America Men’s At-Large Third Team this week by the College Sports Information Directors of America. To be eligible for Academic All-America recognition, a student-athlete must have been named First Team Academic All-District. To be considered for that award, a student-athlete must have achieved a cumulative GPA of at least 3.30, be at least a sophomore academically and be a starter or key player on the team. Brett was named to the third team after achieving an impressive 3.43 GPA in finance, also making it onto the academic honour roll three times. He was named to the first team last season. (CISC): The Cayman Islands Sailing Club was host to the 3rd annual Stormchaser dinghy regatta last weekend and the weather proved to be suitably stormy. 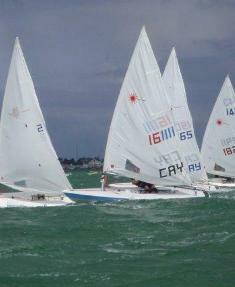 The Stormchaser regatta was introduced to mark the arrival of the hurricane season and takes place in June every year. Sailors had been watching the forecast all week, which was showing winds up to 20 knots and above. On Saturday, the first day of the regatta, winds were high and the North Sound was white with wave action. The youth event was called off but the more intrepid adults made their way out to the race course and revelled in the strong conditions. The first race saw the coaches, Raph Harvey and Kelvin Brown, take the top two places but Rob Jackson bounced back to take the 2nd race. Last year’s winner, Nick Taylor, had suffered equipment failure in the first race but after coming ashore to change boats rejoined the racing and took three third places. The course was fairly long and with the strong conditions there were some weary sailors on shore after racing was over. Raph was leading by just one point from Rob Jackson with Kelvin in third place. Sunday saw no respite in the weather and the winds had actually become stronger. With three races still to sail the racers knew that they had to sail hard just to keep their rankings and harder still to overtake their opponents. In the first race Rob Jackson had overcome a slow start and was storming through the field on the upwind beat when his mast broke and he had to be towed to land to replace it. Eduardo Bernal took advantage of the Jackson retirement to record a second place, his best result of the regatta. 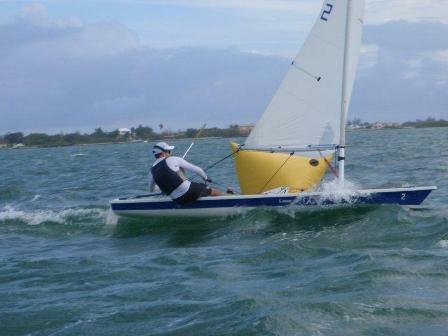 Christopher Delaney was also sailing much better and took two thirds and a second place. However there was no stopping Raph Harvey, who had come out determined to hold on to first place, and he sailed three great races, winning them all. Stormchaser is sponsored by Cayman Distributors and Red Stripe and club manager Rick Caley expressed his gratitude to Frank Roulstone and his team who had supplied refreshments. “The sailors gave their all out there and appreciated the Red Stripe after racing”. The Cat Boats have traditionally joined in the Stormchaser regatta but the conditionswere just too much. Organisers hope to run a make up regatta for them in the near future. The Youth Stormchaser will be run this Sunday June 12th at 11 am. For more information about the sailing programme at CISC, please contact us at 947 7913 or email admin@sailing.ky. The lawyer pointed out that even if the judge did not believe Manderson’s account of the night — that Andy Barnes or Damion Ming had shot him as he crouched on the stairs at Maliwinas Way — it still did not prove guilt on the teen’s part. The lawyer said there was no tangible evidence against him in relation to the shooting or that he was even involved in an organised conspiracy to rob Duran with Jeffers and others. “What evidence is before you that you can commit to writing in your ruling to state that you are sure he is guilty of the joint enterprise to murder?” he asked the judge rhetorically, before addressing the crown’s circumstantial case against his client. Fisher said the crown’s theory that Jeffers, Craig Johnson, Manderson and at least one other assailant were all at the scene together about to commit a joint enterprise of robbery fell apart because just as the crime was about to take place, Johnson and Jeffers were on the phone to each other chatting and Manderson was talking to his brother on his phone. He also noted that while the phone evidence had connected Jeffers to Manderson, who were, the defendant admitted freely, good friends, and Jeffers to Johnson, there was no link between Johnson and Manderson in the phone records. Manderson had given different accounts to the police and had lied about his behaviour that night, which gave rise to suspicion, but this was not evidence, the lawyer noted. He said the time lines did, however, support Manderson’s account and the contamination of the scene by so many people in the effort to save Duran’s life made the positioning of the bullets questionable. He also said the tiny amounts of mixed DNA inside and outside the hat on the balcony, which there was no evidence either the deceased or the defendant had ever worn, was a mystery, but was more likely explained by secondary transfer and certainly not evidence of his client’s guilt. There was no evidence, the defence attorney emphasised, that Manderson had ever left his home armed with a gun to go commit a robbery at Maliwinas Way. Despite witness evidence from Jeffers’ former girlfriend that he had told her to tell the police it was the Logswood Boys that shot Duran, there was no evidence that anyone had told Manderson to blame Barnes or Ming. The QC said that the alibi evidence for Ming and Barnes was also in question as there were inconsistencies.He said the alibi for Ming, who was killed two weeks after the Duran shooting, was given by his girlfriend, who would not be the first witness to attempt to protect the reputation of someone she loved even after death. The QC listed a number of possible scenarios of the night in question and pointed out that any of them could be true or not, but when it came to an accusation of murder against his client it had not been proved. “The evidence just isn't there,” he noted as he said the crown's case was pieced together based on unproved theories of a conspiracy and asked the judge to return a not guilty verdict. Justice Charles Quin is hearing the case alone without a jury and will be delivering a written ruling with his verdict, which is expected in around one week. Manderson remains in custody in Northward prison on remand, where he has been since he was arrested for the killing in March 2010 just before his seventeenth birthday. Raziel Jeffers, who is also accused of killing Duran, as well as Damion Ming and Marcus Ebanks, was due to appear in court on Friday morning to settle a date for his trial, which has been delayed as a result of legal representation problems. (The Guardian): It is not the way the scribes of yore would have done it but Iceland is tearing up the rulebook by drawing up its new constitution through crowdsourcing. As the country recovers from the financial crisis that saw the collapse of its banks and government, it is using social media to get its citizens to share their ideas as to what the new document should contain. "I believe this is the first time a constitution is being drafted basically on the internet," said Thorvaldur Gylfason, member of Iceland's constitutional council. "The public sees the constitution come into being before their eyes … This is very different from old times where constitution makers sometimes found it better to find themselves a remote spot out of sight, out of touch." 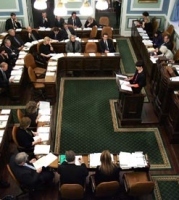 Iceland's existing constitution dates back to when it gained independence from Denmark in 1944. It simply took the Danish constitution and made a few minor adjustments, such as substituting the word "president" for "king". In creating the new document, the council has been posting draft clauses on its website every week since the project launched in April. The public can comment underneath or join a discussion on the council's Facebook page. The presentation was met with considerable scepticism by the audience, which packed the district's civic centre as speakers pointed out the many contradictions. Imparato and his team heard the concerns that the people had over the water lens, potential flooding, the dive sites, the natural environment, the impact on the community and the future costs to the people to complete the cargo port and supporting infrastructure once Imparato had dug the hole. Several speakers, including people from East End, West Bay, North Side and George Town, told the developer that there was little support for the project across the island and asked him not to press ahead. In the audience were representatives from the local business community, quarry operators, the dive industry, and the wider tourism sector, as well as political representatives. Arden McLean, the MLA for East End, said that the people of his district did not support the development as he said his constituents viewed it as an invasion of their lives from which they would not benefit. “Your project is not welcome in this community,” McLean said. “And when people are not welcome they should not try to impose themselves.” He also said that the developer had shown a lack of respect to the East End people when he had undertaken a massive advertising campaign to try and persuade people to support the project but had placed only a small ad in the notices section of the paper when it came to announcing his intention to come to the district. “The people should not be treated merely as an obstacle that you have to overcome,” McLean added. 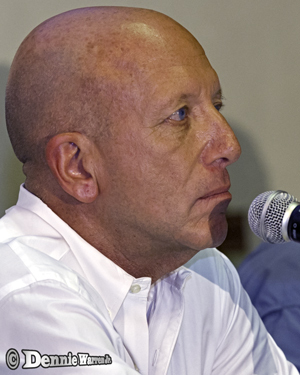 A number of questions were raised by the audience about the marl and whether that would be sold here or exported, the nature of the proposed agreement with government for the development zone and the exemption from taxes and duties, how much of the project Imparato would actually develop and what joint venture partners he had with other investors for the various proposed elements of the facility, such as the oil storage, the transshipment and cruise home port and yacht marina. Pressed by North Side MLA Ezzard Miller about how the project would be developed, Imperato said that down the line he would be seeking investors in joint ventures to partner with him. He said, however, that there were no plans to partner with government for the cargo facility as that would be up to the Port Authority to decide what to do. He also said he would be responsible for the ring road around the project, but government would pay for the east-west arterial to link the facility to the rest of the island. He revealed that there is, as yet, no deal in place with government and that he had been asked to complete the EIA and the economic assessment before it would begin discussions. Despite the level of opposition and the crowded hall, the people remained calm, and while there was a police presence, there were no angry exchanges. Several speakers articulated the opposition to the project and the reasons why and asked the developer to consider using his land for other projects. Woody DaCosta spoke of the very real and widespread fears of the threat posed by the development to the water lens, which were not alleviate by the comments of the author of the EIA, who said it could be prevented. Bo Miller spoke about the wider environmental risk being too great when the project was not needed or wanted. “Thank you for your presentation but it’s a risk we don’t need to take,” he added. Opposing the project from a very different prospective, local attorney Sammy Jackson, who was representing the quarry operators, pointed out that his clients were very uncomfortable about the arrangements between government and the developer if the project was approved. He said his clients had to follow an onerous legal process in order to quarry at all and they were faced with the biggest every quarry in the islands' history and it appeared as though the developer would be allowed to completely by-pass the usual rules, creating exceptionally unfair competition. 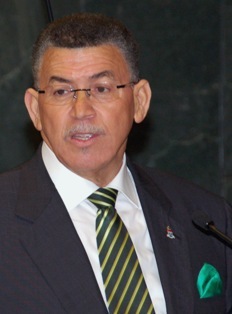 Billy Adam, a veteran environmentalist and campaigner for good governance, pointed out that the Cayman Islands had been warned about over development back in 1999 in a study that Imparato was himself a party too. He also reminded Pilar Bush, whose company is representing the public affairs element of the project, of her role in the Go East campaign when she was director of tourism and the goal to ensure sustainable development in the eastern districts and to learn the lessons from over development on the rest of the island. Bush answered that she believed the East End Sea Port proposal would have a tourism benefit and help boost the sector. Rounding up his comments about the dangers of the project, Adam also noted that the right to demonstrate and march was a very important democratic right utilized the world over by the people to show their opposition. Following the meeting, Bush told CNS on behalf of the developer that the opposition encountered in East End would not derail the process which the developer had started and still intended to follow. While acknowledging the not unexpected opposition at the meeting, she said that the developer had received considerable support across the community for the proposal. In the end the project will be down to the decision of government. After the meeting last night the two district MLAs have confirmed that they will be posting bill boards on Tuesday afternoon on the piece of crown land at High Rock that the developer will need to use in order to begin his project. They will be hosting a fish-fry to raise support for the opposition campaign. See EIA and other details of the commercial port here. 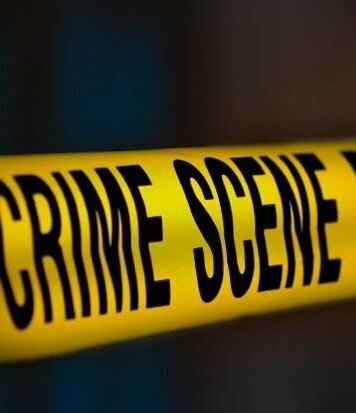 (CNS): Two masked men believed to be armed with handguns attempted to rob the occupant of a house on Greenwood Drive, George Town, as they arrived home with shopping on Thursday evening. According to the police report, which did not state whether the victim was a man or a woman or the exact time, the men approached the person as they entered their home. The suspects shouted at the victim, “Open the door give us themoney!” but the occupant slammed the door and said they were going to call the police. When the victim went into the kitchen, one of the suspects pointed what appeared to be a firearm at the occupant through the window and threatened to shoot. The occupant then rang the police and the suspects disappeared. No shots were fired and no one was injured. Police said the would-be home invaders were wearing black long sleeved shirts, were dark skinned, slim build, around 5’ 10” tall and both spoke with Jamaican accent. One was wearing a white mask and the other a black mask. Anyone with information should contact SDC Howard Campbell at 525-9923 or the confidential Crime Stoppers number 800-8477 (TIPS). (CNS): Updated Friday 2:50pm — The budget presentation has been delayed a few more hours and the premier will be now be delivering the 2011/12 Budget in the Legislative Assembly at 6:30 this evening, officials have announced. As a result of needing to get UK approval, time is ticking for government, which must have all of the appropriations approved by Finance Committee before the end of this month. The start time, however, is outside of the regular hours of the House and will require a suspension of Standing Orders. The late sitting has raised concerns from Ezzard Miller, the MLA for North Side, who says he has written to the speaker to complain about the unorthodox start time and the lack of notice. Government was forced to delay delivering the actual budget presentation following the Throne Speech by the governor last month as it waited for the FCO to approve the document, which, as a result of the levels of spending on civil service personnel, had raised concerns, the premier has said. It is not clear what government has had to do to gain the UK’s approval but officials said government had spoken with the FCO representatives yesterday morning. The Legislative Assembly sent out notice on Thursday evening that the country’s parliament would be sitting Friday afternoon in order for the premier, in his role as finance minister, to deliver the long awaited annual government spending plans for the next financial year. Government is expected to deliver a plan with a small deficit, despite the three year plan calling for a $10 milllion surplus, with an aproximate 7% cut in spending on civil service costs. In the wake of the news that the House would be reconvening at 4:30 pm on the eve of a public holiday weekend, Miller wrote immediately to the speaker, boycotting the sitting in protest. Noting that as he is not a member of the business committee, he said he was not informed of the meeting until 6:14 pm Thursday when he received an email from the deputy clerk on behalf of the speaker. “I find this notice to be totally unacceptable, both in the period of notice given and the time of 4:30 when it is scheduled to begin,” Miller said. He pointed out that the House had been adjourned for longer than seven days and the meeting to deal with the Budget had been postponed on four separate occasions. This suggested that while the budget presentaiotn might be in the public interest, it could not be urgent. “I will not be attending in protest to the disrespect being shown to the minority in the House,” he added. It is understood that the premier will present the budget but the meeting will be adjourned before the debate begins, giving the opposition members time to consider the documents before offering their position.